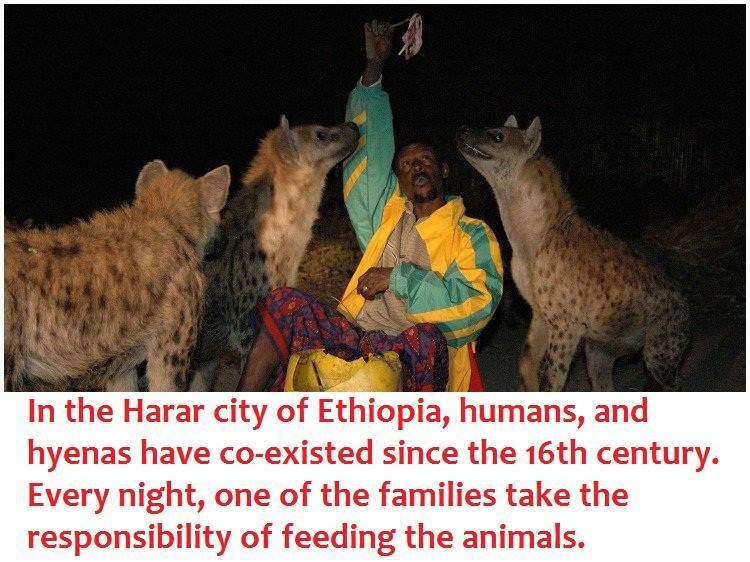 Hyenas roam the streets of the ancient walled city of Harar in eastern Ethiopia every night, seeking scraps of meat to drag to the nearby caves. But residents are not afraid. A family chosen by the town to feed the animals is not daunted by the task despite the dangers that are associated with coming into close quarters with such wild animals. Abbas Yusuf, known as Hyena Man, learnt to feed the hyenas from his father, Yusuf Mume Salleh, who fed them for 45 years before passing the job to his son 13 years ago.“Hyenas have never attacked the people of Harar after my father started feeding them, unless you harm their babies,” Abbas Yusuf told Reuters. To encourage visitors to trust the hyenas, Abbas feeds them directly from his mouth.The hyenas live in caves outside the city and roam the rubbish dumps, also outside the walls. Some hyenas give birth in the ditches in the middle of the city. Harar, with a population of 240,000 people, started to expand out of its original wall after 1882 and is now surrounded by modern buildings.It has been a center of Islamic culture since it was founded in the 7th century. In the 16th century Emir Nur Ibn Mujahid built a four-meter-high protective wall around the city, pierced by five gates.